How did “Take Care” begin and grow into The Leonard Cheshire Foundation in Cuffley? My first recollection takes me back to the early 1980s, when the best next door neighbour ever, Mary Solender, called in to tell me of the message she had received from God. She was waiting outside The Free Church, now called The Life Church in Cuffley, waiting to collect her daughter from Sunday School. 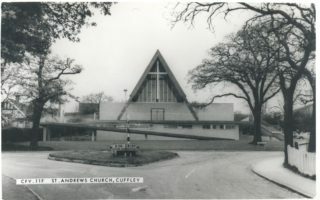 Something made her go into the church and, whilst she was inside, she had a thought that, if she could help the elderly and vulnerable members of the community in Cuffley, they may well be able to stay in their own homes longer. A few days later, Mary was in Cuffley Village when she met her friend Gill Stevenson, from St. Andrews Church. They were chatting, and Mary told Gill of her experience in the church. Gill said, “I have been thinking along the same lines.” This is how two young mothers got together and Cuffley Care was born. Their first meeting was in Gill’s kitchen in the Autumn of 1984, and they were discussing how to begin their project, how to advertise and what legal matters had to be dealt with. The Reverend Bob Naylor appeared from The Leonard Cheshire Foundation, with a set of rules and regulations several inches thick. Whilst they were talking, they happened to look out into Gill’s back garden where there were still many apples on the apple tree and a crowd of birds pecking at them. Suddenly all the birds took off together, and Mary said, ”That’s it, the sign to get out, search and help.” They gathered together twelve likely minded, willing helpers by advertising in the Church Magazine and Local Papers and set about to decide how to begin their project. The hope was to offer part-time care, pet minding and walking, gardening, shopping, etc. The carers would collect £3 per hour and give 10% back into the kitty to cover costs. 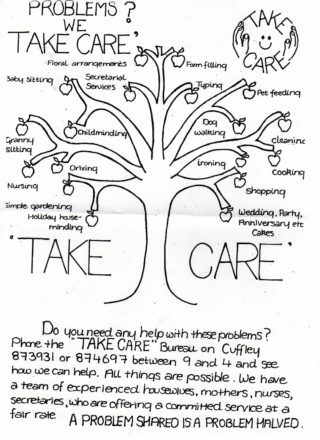 Gill’s daughter designed the original emblem of caring hands encircling a smiling face and later the poster based on “The apple tree theme”, of which a copy is attached showing the comprehensive list of help that was available. The Take Care Offices were based at both Gill’s and Mary’s homes, and they expanded from gardening and pet minding into help including painting, decorating, washing, ironing, shopping, cooking and sitting with lonely people to help and support them. Mary’s husband David even installed a burglar alarm for a gentleman who was frightened of living on his own. One of the first clients was a lady, knee deep in water as her house was flooded. Mary took the only option she could see and invited her into her own home whilst the flood damage was repaired. Next, there was another lady who managed to get stuck in her bath. Mostly it was caring and help with daily tasks which enabled people to stay in their own homes. Clients came thick and fast, so both Mary and Gill retired from their existing employment and concentrated on Take Care. Within the team there was an ex-Matron and a SRN nurse, Doreen Fossett, to guide and help them. Doreen conducted a series of classes on resuscitation, among others. They soon realised that more help was needed and they sought advice from Social Services, Doctors, Hospitals and other official bodies as to how they could responsibly help those in need. Almost immediately, referrals from these people began to arrive, and what started out as a few people helping those in need developed into a small business, co-ordinated from their home kitchens. When Mary and Gill were required to help with something new to them, they both prayed and, amazingly, often an answer arrived. On one occasion, they were asked if they could look after an Italian quadriplegic. They prayed for help and, shortly afterwards, they received a telephone call from someone who was used to looking after paralysed people and who also happened to have an Italian husband – problem solved. There was also a gentleman of Greek origin who developed dementia and could no longer speak or understand English. A lovely, jolly Greek Lady came to the office looking for work as a carer, and that was another answer to prayer, and she worked with him for many years. There were so many people able to work part-time and enjoyed doing a fulfilling, worthwhile job. By 1986, it was apparent that “Take Care” was taking off in a big way and needed to be put onto a proper business footing. Enquiries were made about insurance cover, but the cost was prohibitive, and this prompted an approach to The Leonard Cheshire Foundation for funding. Gill and Mary attended a meeting with the foundation, taking their carefully prepared business plan, and much to their surprise and delight they were offered a grant, but the grant was conditional on Cuffley Care not taking on any Clients over 65 years of age. So the friends decided to soldier on without the grant, setting up their own Management Committee in the Spring of 1986. Jim Kirkpatrick was the first Chairman, and the inaugural meeting of the Management Committee was on 15th May 1986, comprising Gordon Akerman (Treasurer), Pauline Gaffney, David Solender, Mavis Wilson, John Stevenson, Mary Solender and Gill Stevenson. Gill and Mary continued with their complete dedication and faith to keep “Take Care” going. However, they did not give up with Leonard Cheshire and continued to press for financial help, and eventually convinced the foundation to give Take Care a grant as follows: £6,000 grant for 1st year, £1 for every £1 raised in 2nd year and £1 for £2 raised in the 3rd year. This first contract with L.C.F. commenced on 1st October, 1986, and TAKE CARE, as it was then known, had 18/20 clients, 13 carers and covered the area, Cuffley, Potters Bar, North Enfield, Cheshunt and a limited number from Broxbourne. The Carers’ wages were £2-75 per hour. Mileage 15p per mile. Sundays and Bank Holidays £3-25 per hour. From then on, regular Committee Meetings were held and on 20th November 1986 it was agreed that Gill and Mary should receive a first salary of £35-00 per week each. At this time, Take Care was becoming a serious busines,s and the kitchens of Gill and Mary could not take any more files and business correspondence. Proper premises had to be found, and it was in November that the much-maligned Double Glazing Salesman came to the rescue. Mr Arnold Bird, Managing Director of Everest Double Glazing and a member of The Free Church in Cuffley, provided a space under the stairs in the Everest block of offices in Sopers Road, and they also provided a desk, filing cabinet, telephone with a separate telephone line and use of a photocopy machine. The Everest staff called the girls “The Flying Nuns”, as they were always coming and going. Mary attended a meeting in the Mayfair Offices of The Leonard Cheshire Foundation and found herself sitting next to none other than Group Captain Leonard Cheshire V.C. She likened it to sitting next to God; an aura of goodness emanated from him. July 1987 saw Mary and David retire to Devon, and Jill Jobling, a lovely Christian friend, took Mary’s place alongside Gill working as an organiser. Also in 1987, Clifford Smith of Smith & Co. was officially appointed as Christian Auditor. Finance at this time was causing concern, with just enough money to last a fortnight, so on 23rd February 1988 the first Fund Raising Committee was formed, with Jane Burgess joining the Management Committee as fund-raiser on 24th October. The service continued to grow, and the need to expand the office again was becoming very important, and in May 1990 Take Care was offered office accommodation in the Cuffley Youth Centre and, with the help of Richard Gentle and Gill’s son, they moved in. Four years later, in August 1994, the business was still expanding so another move was needed, this time the use of an additional room in the Youth Centre. Formal Training was provided through Leonard Cheshire Foundation for all types of care, and many carers obtained an NVQ pass. Jul.1990 Cuffley Carnival – Take Care had a float and ran a stall which were financially successful. Oct.1991 Silent Auction – This made a lot of money, was great fun and a lot of hard work. Jun.1992 Garden Party in the garden of Mary and Arnold Bird of Everest Double Glazing. Nov.1992 Cockney Evening at Cuffley Hall. Jul.1993 Lunch & Flower Arranging in an upmarket marquee in the grounds of Michael Goulding’s home in Broxbourne. Tickets sold for £25 per head. 1995 Cuffley Care had 3 runners in the London Marathon and launched them with balloons. Nov.1997 Old Thyme Music Hall. 1997 Irish Nights at Tesco Country Club, Wolsey Hall and Broxbourne Civic Hall. Mar.1998 Golf Day at Brookmans Park and Country and Western Night. Jun.1998 A Chas & Dave sausage & mash bash. Many new staff joined in the period 1989 to 1993. 1994 saw a very busy year, starting with a change of name to LEONARD CHESHIRE CUFFLEY . Then started the Monday morning prayer meetings, which were found to be an essential part of the working week. It was known as the Power House. June 1995 began discussions on extending the building to provide a day centre. Day Care was provided on site in one of the other Youth Centre rooms, and this became very popular for lonely people but was not really big enough or suitable. The first Day Care Club was held on 31st October 1996 and was part funded by Hatfield Social Services. After an enormous amount of hard work, Cuffley Care received a Lottery Grant of £37,500, which was to provide funds for the extension for the Day Centre. On 23rd April 1999, the Day Care started in the new premises and to this day is open four days a week, and dinner is provided as well as a mixture of craft, entertainment and quizzes. 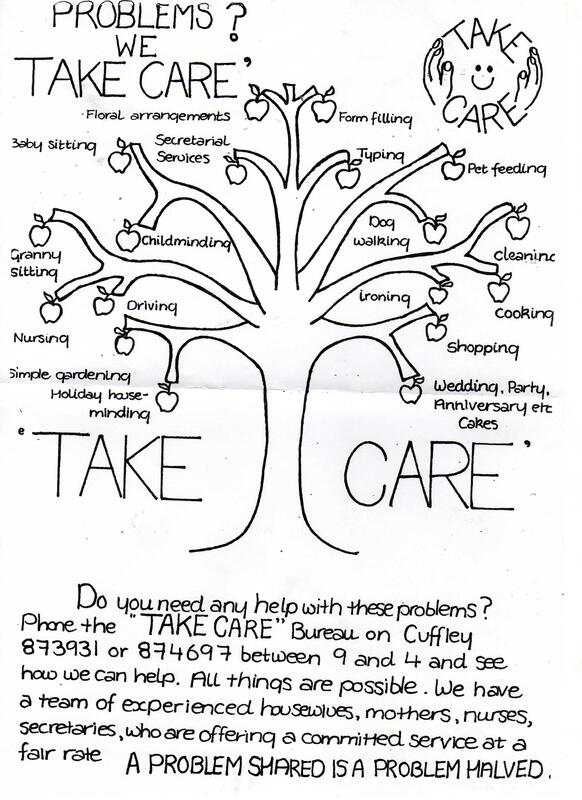 Cuffley Care at Home Service thrived, and by 2002 there were 30 carers and around 100 clients being cared for. Over the years, Cuffley Care received several Royal Invitations, the first one in April 1987. An invitation to a Garden Party at Buckingham Palace was received for one care assistant and one client. Mary and Gill drove them to the Palace and, in the pouring rain, managed to find one parking place. Struggling to get the wheelchair out of the car, a kind gentleman stopped to help, and when they turned to thank him they found him to be Cardinal Basil Hume. An invitation to a day at Ascot Races Charity Day in 1987 was received from The Queen for eight clients and, together with three staff, they went in the Church Minibus. Yet another invitation arrived for a carer and member of the committee to attend a Reception at St. James’s Palace in the gracious presence of Her Majesty The Queen. It was accepted for Wednesday 14th October 1992, and in 1997 there was another invitation to St. James Palace. A year later, Gill and a client attended another Garden Party at Buckingham Palace. Unfortunately, Mary contacted Parkinson Disease and lived a very uncomfortable time towards the end of her life. Mary sadly passed away on Wednesday 20th September, 2017. As I write this in October 2017, Leonard Cheshire Foundation are considering closing all their Day Centres, including Cuffley. So, in 34 years of caring and helping others, Gill Stevenson, although retired for several years, is again trying to solve the problem of how to continue the Day Centre, which so many home-bound people have attended and enjoyed. This page was added on 13/12/2017.